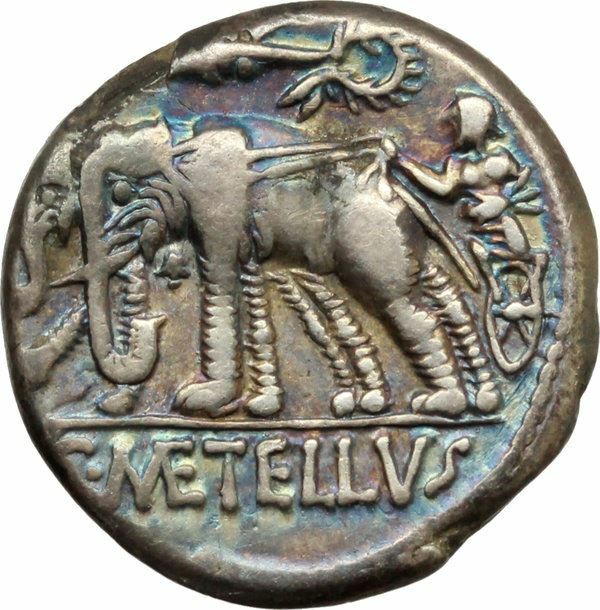 Caius Caecilius Metellus Caprarius was one of the moneyers for the year 125 BC. He served under Scipio Aemilianus in Numantia around 133 BC, and was praetor in 117 BC, before being elected Consul in 113 BC. Caprarius had three sons. One was Quintus Caecilius Metellus Creticus, who was praetor in 74 BC and consul in 69 BC. He was pontifex from 73 BC until his death. Creticus was given the proconsular command against the island of Crete, which was aiding Mithridates and infested with pirates. He defeated the island and triumphed for it in 62 BC, receiving the cognomen 'Creticus'. Another son was Lucius Caecilius Metellus. He was praetor in 71 BC. He succeeded Gaius Verres as governor of Sicily in 70 BC. He died in office as consul in 68 BC. Marcus Caecilius Metellus was Caprarius' third son. He was praetor and president of the extortion court in 69 BC.